Stocking: Rudd, Roach, Crucian, Tench, Common, Leather and Ghost Carp The fishery is covers approximately 1 acre and has 22 fishing platforms (swims) offering a choice of fishing experiences. 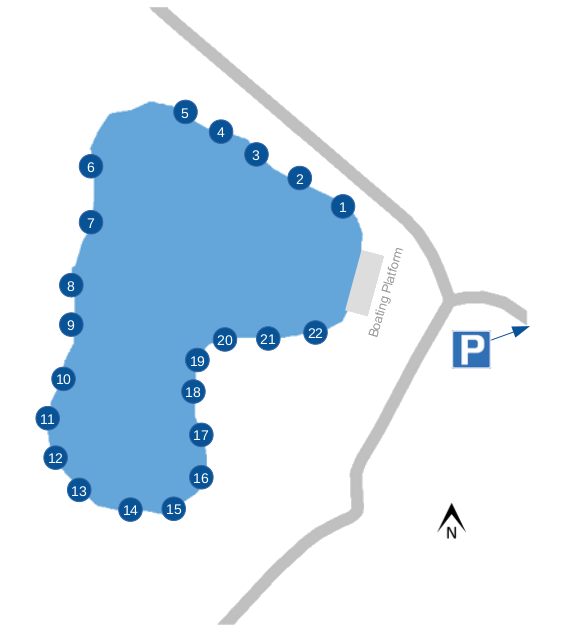 Swims 1 – 5 are located close to the estate road and provide easy access to those with limited mobility, these swims are double sized allowing those with a disability more space or the opportunity to have someone fish alongside them for support. Swims 6 – 10 offer more of a challenge with reed beds and the island offering any fish an opportunity of escape. These swims are not for the faint hearted and are ideal for the angler with more experience. Swims 11 – 17 provide a different kind of challenge as some times the fishing is red hot and other times not so. The water tends to be shallower in this bay and hooking into a big carp can be interesting as they shoot across the water towards the island and reeds for cover. Swims 19 – 22 give an angler plenty of options from casting to the island to fishing close in, and you will not be disappointed, as carp tend to patrol these areas frequently. In general all swims offer a challenge, and whilst some are happy with a big bag of carp the silver fish really can bring a lot of satisfaction with a decent stamp of rudd, roach, crucian and perch. There are a few elusive tench that if caught are a bonus as they tend to keep themselves to themselves. This is an ideal water for young people to fish and learn new tactics, we ask those under the age of 16 years are accompanied by a responsible person. On each Friday 9.00am to 12.00pm swims 1, 2, 3, 20, 21 and 22 are not to be fished from to allow the Springbok Model Boat Club clear access for sailing.